Plum pie and venison stew. Life is tough. These are two easy-peasy recipes that get a lot of bang for their buck, pun intended. Aaanyway, if you get your hands on venison, as I seem to, this is a tasty simple stew. Hilde happened to have the meat of a red deer, a really big beast, thawing in the fridge. She turned it over to me. I’m calling it “Kålrot” because the vegetable in question goes by so many names. The humble Brassica naps goes by swede, rutabaga, and neep, all depending on what part of the English speaking world you come from. That’s too confusing for me! I opted to go local and call it by its Norwegian name. So, enough of that! Take your venison, however much you want, and slice it into about 3-4cm chunks. Season them with salt and pepper, and dust them in a light coating of flour. Heat a heavy bottomed pan over high heat. Brown the meat well in a mix of oil and butter. Do it in batches and remove the browned pieces to a plate. Overcrowding the browning meat will allow it to brown and keep it from just steaming; mixing oil and butter stops the butter from burning as quickly. Little tricks. When the meat is all done there should be a bunch of brown bits in the bottom of the pot. These are most excellent. They are pure meaty caramel flavour. Put a little bit of water in the pot and scrape the bits (frond, they call it) free from the bottom. Then, on to the veg. I added what I had on hand, and it turned out deliciously. I wanted this stew to be heavy on the meat with less emphasis on the vegetables, so I chose things that would meld into the stew. First add the kålrot, onions, and leek. Add as little water as possible to keep them cooking well. Then, let the whole shebang simmer for a loooong time. When the meat is soft, throw in the carrots, and cook until they are just soft. Hopefully the water level is low, and the stew has thickened up a bit by the end. We served it with mashed potatoes that Hilde made. Her mom loved the stew, and kept taking more! It was a success! 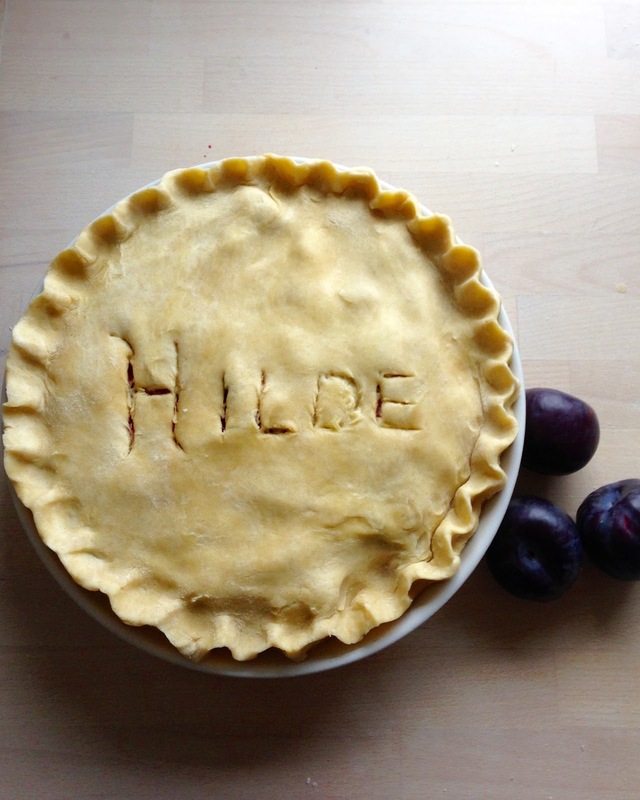 Around here we call it Hilde Pie for obvious reasons. Its pretty straight forward. Make my crust recipe with the fancy French name, Pate Brisee: Pie dough, and get your hands on a whole lot of plums. Usually people use Italian prune plums for a pie, but we had a firm eating plum, and I went with it. I quartered the plums, added sugar, and a slurry of cornstarch (cornflour) and cold water. I took about 2/3 of them and cooked them in a pot until it was very thick and jammy. I let the jam cool and tossed the remaining plums in it. I then rolled out the pie crust, poured in my filling, slapped a top on, glazed it with egg yolk, dusted it with sugar, and baked it. I’d say bake it around 400˚F/200˚C for the first 15 minutes, then lower the temperature to 350˚F/175˚C until the filling is bubbling up and the crust looks done. Et voila! You can choose how thick you want the filling based on how much cornstarch you add. The consistency is completely dependent on the water content of your plums. These were pretty juicy, and I left the filling quite loose. That’s why it is pooling in the bottom of the dish. It didn’t bother us one bit. It flowed together with the cream and was irresistible. Again, it was a winner with Hilde’s mom. Her father isn’t fond of cooked plums, and so didn’t eat it. Hilde just asked for more pie. A woman after my own heart!